Select Length 6'0" 6'6" 7'0"
Length, Rod Power and Pieces must be selected above. With a real-able design that's backed with a grey, black, and lime green accent handle, the Scheels Outfitters NOS Spinning Rod is ready for anything thrown its way. With a High Modulus Ni8 Nano Technology Blank and a golf grip style handle that's designed for a better feel and secure grip, you'll be amazed by what this rod can do. Ready to lure in the biggest fish below the surface, this rod can any handle any multi-species catch while the titanium guides bring the design of this rod together with a combination of strength and sensitivity. Note: This rod may be a discontinued product or a past year's model. 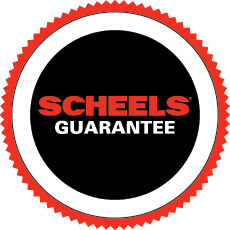 Even though this is a past year's model, it's still backed by the Scheels Guarantee. Everything you buy at SCHEELS on sale or otherwise is guaranteed satisfactory or your money back. You don't take chances at SCHEELS ... ever. Length: 6' 0", 6' 6", 7' 0"
Don't waste your money on this rod. Pure garbage!!! Great rods for the price!!! Bought on sale for 20% off.